← Who will Play the Butcher? I think the Psalm shows the direction one need to follow the righteous path which quells the fear of death. All Psalms help us to connect with the Lord. My favourite is Psalm 23 – The Lord is my Shepherd. Each Psalm shows that human troubles and sufferings have always been there. Irrespective of what we are, we all have to undergo the vicissitudes of life. There is no escape! The ” Book of Job” is an example – Even if you do good, suffering can happen. We have to accept these realities of life. The limited span of life and the even more limited span of our brain / thought cannot perceive the ultimate reality, and hence the search for a meaning to life is also limited. Logic and Reason cannot answer such existential questions. Hope and Faith can only keep us going. Psalms help us to do so…. Interesting. People take comfort in words ascribed to God. Surprisingly some evangelists have no qualms in lying and deceiving to further their mission, by hook or crook. This reduces the credibility of the thing they wish to promote. I wonder if God would appreciate it. Evangelists to this day are churning out stories and performing ridiculous tricks to propagate faith in Jesus, a man who represented truth and his father in heaven. Similarly fake Gurus reduce their own credibility and the Hindu religion by their actions. However Buddha and Jesus led such spotlessly clean and noble lives, that no fraud can devalue them. I do not require an evangelist to revere and have faith in what Jesus represents, or for that matter the Buddha. 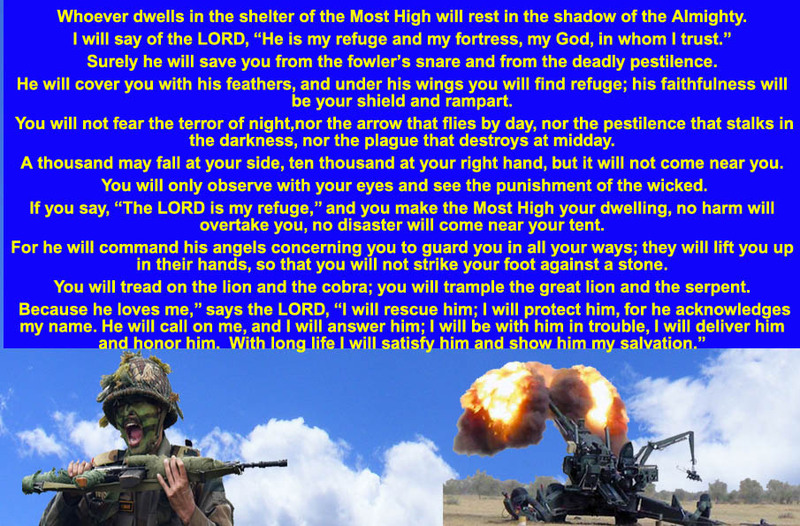 Psalm 91 gives courage and solace to soldiers, even if Brigade 91 was a fabrication by an evangelist. For a soldier,unflinching faith in HIM is the supreme motivator during combat. Without this no soldier can ever over come fear encountered in the battle field. Like Sikhs perform Ardas which is invoking the Godthe God Almighty. This is a simple psalm that proclaims a soldier’s implicit faith & trust in Almighty God as his ultimate protector. A soldier, (especially Indian one) couldn’t careless whether it was written by evangelist or panditji or babaji or maulaviji. Good one as usual Reji. Keep writing. No doubt it is prayers & faith that keeps us on the move and gives hope. I happened to discuss this article with my family. My children have been reciting this daily in our evening family prayer for many years. Blame it on my concentration and partly on the speed at which my children recite it, I never understood the full meaning of it, till I read it myself from Bible first time in life. I felt great after reading it myself. Thanks for this wonderful article.